You'll Discover How Easy It Is To Build A Simple Set Of Stairs Using Metal Angle Brackets And Wood Stringers, In Just A Few Hours. Think About It...You Could Be Building Your Stairs Today. If you looking for a step-by-step instruction booklet on building stairs, you're in the right place. We took stair building to the next level by adding plenty of easy to follow illustrations, tips and pictures. That's not all though, I'm going to provide you with lots of of free videos, articles, pictures and access to a website, that's devoted almost entirely to building stairs. 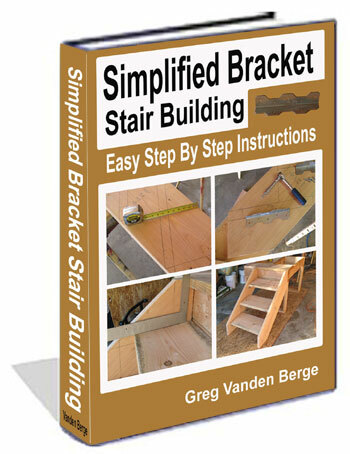 If you're looking for a complicated book that will teach you how to build circular, curved, bracket type or any other type of stairway that would require complicated mathematical formulas, this isn't the book, for you. Simple and easy, not complicated and difficult. Building stairs isn't as difficult as some construction experts make it out to be. Don't fall into the old trap that you can't do it, impress your spouse, friends, neighbors and in-laws by building an incredible stairway to your new deck, garage loft, front or back porch or even inside of your home, with this simple and easy stair building book. More than half of every stairway built today is going to be straight. Whether it goes from one floor to the next or it has a stair landing located somewhere in between, the basic principles of stair building are definitely located in this book. You can apply all of these beginner stair building techniques in this e-book to almost any type of metal bracket stairway construction. This book does provides you with the important essentials of basic stair building. When the famous coach for the Green Bay Packers, Vince Lombardi met his football team for the first time, he held up a football and said, "This is a football." In order to be good at anything, you need to understand the fundamentals and Vince Lombardi knew this. We can't build a good stairway with out the understanding the basics and the basic start with knowing how to select and use the right types of lumber and other building materials, especially if you're planning on building a stairway that going to last a long time. You can build a fantastic stairway and this book provides you with the knowledge necessary to accomplish the task. Remember, the title of the book is Simplified Stair Building, it doesn't get much simpler. Why pay should you pay a professional, when you can download this book today and start building your own stairs immediately. In the e-book you will learn how to lay out one stair stringer and then use it as a pattern to mark and then cut out the remaining stair stringers. The biggest problem with stair stringer layout is what to do or what not to do at the top and bottom of the stair stringer. Stair stringer layout is probably the most important part of stair building. That's right, even contractors use this book to build stairs, even though they don't want you to know about. Stair building is one of the most difficult parts of building a home and some of these professionals make thousands of dollars every day, doing something that you could do on your own, if you had the knowledge. I made between 200 and $2000 a day, installing and repairing stairs. One time I was replacing damaged stairways on an apartment complex, making $1600 in less than five hours. This book was originally written for contractors interested in making more money, until I realized that anyone could do it. 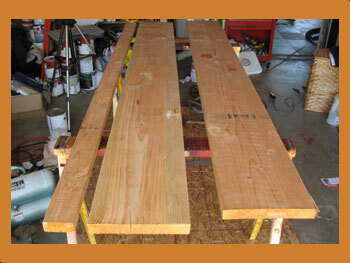 Once you understand the fundamentals of stair building, you can build almost any type of stairway. Whether you're a contractor interested in making more money or a homeowner who's interested in saving money, Simplified Stair Building should be part of your library. If you have any variations in your stair tread thicknesses, decking, landing or floor sheathing, you will need to make the proper adjustments while laying out your stair stringer or attaching a ledger to the wall. This book provides you with fundamentals that are often overlooked by building professionals, as well as do-it-yourselfers. 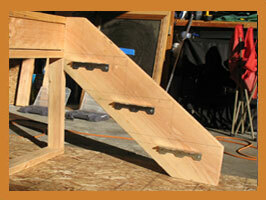 Remember, if you understand the basics, building almost any type of stairway is going to be easy. This Book Can Be Purchased In Either Paperback or E-Book Format For 19.99 U.S. Dollars By Clicking on Links Below. E-Books can be downloaded within a few minutes after purchase has been completed. Paperback books will be mailed and could take more than a few days to recieve.